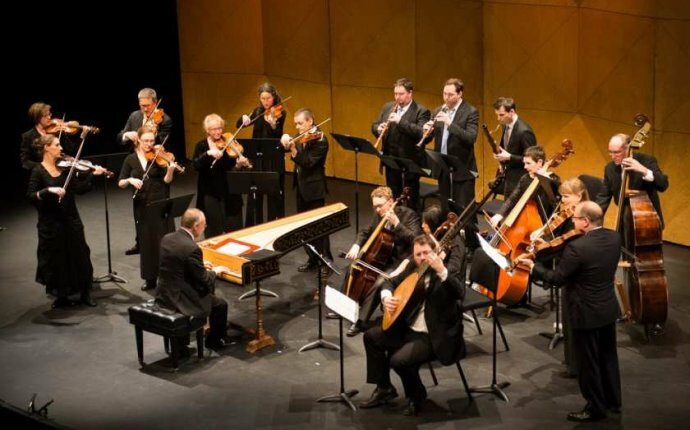 It was like being wrapped in a warm soft blanket of comfort as the Pacific Baroque Orchestra took the audience back three hundreds years to the pure, smooth, rich sounds of period instruments. "We have much less tension in the strings, " explained artistic director and solo violinist Marc Destrubé as he informed the audience of the type of music being played and its instruments. "We use plain gut strings so they don't stay in tune as well. That's why you hear us tuning up a lot. And the bows are different." The program for the evening represented a grand tour of music written across Europe between 1680 and 1780, beginning with Antonio Vivaldi's “Concerto for strings in G Major”. Such a difference it was, to hear the music as it would have been played at that time in comparison to the harder and louder sounds of today's instruments. The violins and violas sang and trilled, the harpsichord was light and gentle, the cello and violone (double bass) glided like smooth melting chocolate (comfort food), each instrument complementing the other, with precision and grace. Soprano Phoebe MacRae joined the orchestra for Jean-Philippe Rameau's “Aria, Une Plante”. Her pure clear voice lifted and soared perfectly and carried the richness and delicacy of the music but the piece was over too soon. A surprise in the program was the inclusion of a work composed by Jocelyn Morlock specifically for the PBO and this tour. Titled “Golden”, the piece began with percussive taps on the violone and cello, followed by gentle movement of a wooden wind chime and bells as MacRae and members of the violin section of the orchestra whispered, "Ssswim in this water." Soon came the sounds of whispering strings like rippling water and light, and angelic magic as MacRaes voice lifted and soared, harmonizing with Destrubé's gentle violin. While the strings continued their melody MacRae ran her fingers around the rims of two wine glasses creating a hanging tone which resonated above the strings. It was pure magic. After intermission Destrubé performed Haydn’s “Violin Concerto in A Major”. Such softness, feeling and precision comes only from one who has mastered his instrument and loves what he does. MacRae returned to the stage for Handel's “Gloria”. Here she shone, portraying sincerely with her voice the mood of each movement. It was not enough. The audience called for more and was given an encore by the PBO in which MacRae showed the dexterity of her voice, the trills, the stoccato, and spine-tingling synchronicity with Destrubé's violin. It was like watching a family working and playing together, and enjoying it. And that enjoyment was projected from the members of the PBO to the audience. For more information about the orchestra, members, tours, visit the web site. Note: There are many more articles on this site. Follow the link to view the Index of Articles.